Our Lawton, Oklahoma, apartments could be your new home. Part of the Comache County, Lawton was once the center of the Oklahoma land rush in 1889. Today the land is teaming with history, which you can visit through one of the many area museums and historical landmarks. Looking for some family fun? The Laugh Out Loud Amusement Center and Urban Air Adventure are only minutes away! For a more cultural experience, be sure to stop by the Historic Mattie Beal Home or the largest artillery museum in the nation, US Army Artillery Museum. Immerse yourself in Lawton’s local culture at the Museum of the Great Plains, Comanche National Museum and Cultural Center and Fort Sill National Historic Landmark and Museum! Love the outdoors? Come explore Lawton’s hidden gems! Wichita Mountains Wildlife Refuge is perfect for hiking fun with breathtaking views. And if you’re lucky, you’ll see the state animal, American Bison, grazing by! Or grab your bathing suit and enjoy a day trip to Lake Lawtonka or Lake Ellsworth! Medicine Park is also a perfect retreat for a vintage cobblestone resort escape with a hometown charm. These quick staycations are just the beginning of what there is to do around town! With Cameron University, The University of Oklahoma College of Nursing and Great Plains Technology Center right in your backyard, you’ll never have to go far to jump start your career path on the right foot! Travel the world with the convenience of having Lawton-Fort Sill Regional Airport minutes away! You have so many options, but it all starts with calling District SIX10 home. What’s Near Our Lawton Apartments? Experience your own tranquil sanctuary at District SIX10, located in endearing Lawton, Oklahoma. District SIX10 is conveniently located near several restaurants, diverse entertainment, and lots of shopping! We’re located near Lawton’s Marketplace, Lawton Town Center, and between Southwestern Medical Center as well as Comanche County Memorial Hospital! One of Lawton’s largest employers and artillery complex, Fort Sill Army Base, is only a couple miles down the road. No matter where you’re headed, you’re sure to have a short commute. Our apartments at District SIX10 give you luxury living at an affordable price. Choose from two or three-bedroom floor plans, ranging from 992 to 1,233 square feet. With a full-size washer and dryer, walk-in closets and a wood burning fireplace, you’ll have comfort and convenience in your home. Our pet-friendly apartments welcome even the furry friends of the family, including large breed dogs. 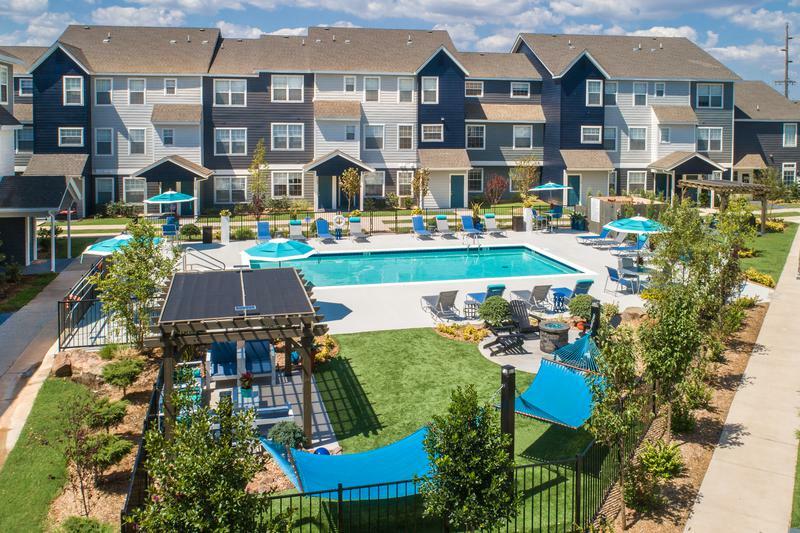 As a resident of District SIX10, you’ll also be able to enjoy all the amenities we have to offer, including our resort-style pool, basketball court and tetherball equipment. Learn more about our apartments in Lawton by setting up a tour with a staff!